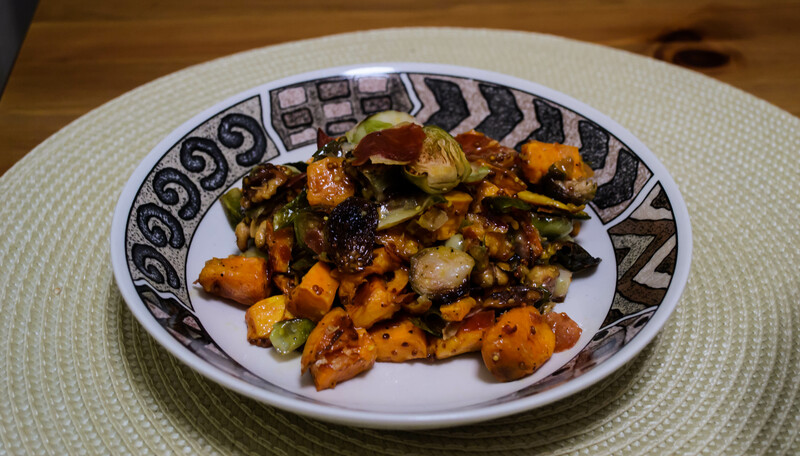 Sweet Potato and Brussels Warm Salad | "blackberry-eating in late September"
The first time I made this dish, which could be called a roasted side dish or a warm salad, depending on how you’re feeling, I didn’t actually make it. Let me explain. Like everyone (she says, because it makes her feel better), I have a few unfortunate… let’s call them character flaws. I’m clumsy. I drop things. I spill. I trip. Last week right in the middle of a lecture about pronouns and antecedents I bumped into the chalkboard and, in my recovery, stumbled into a wheeled desk chair that promptly rolled several feet across the classroom. My students were gracious enough to laugh at me. Where my clumsiness can be amusing or endearing or even charming in other areas of life (I disagree, but N. seems to find it so), it occasionally winds up being dangerous in the kitchen. I take precautions: my knives are sharp, I stabilize my cutting boards, and I try not to do too many things at once. But once in a while, a knife slips, my mind wanders, and I wind up bleeding. This unappetizing truth is what almost did this salad in. 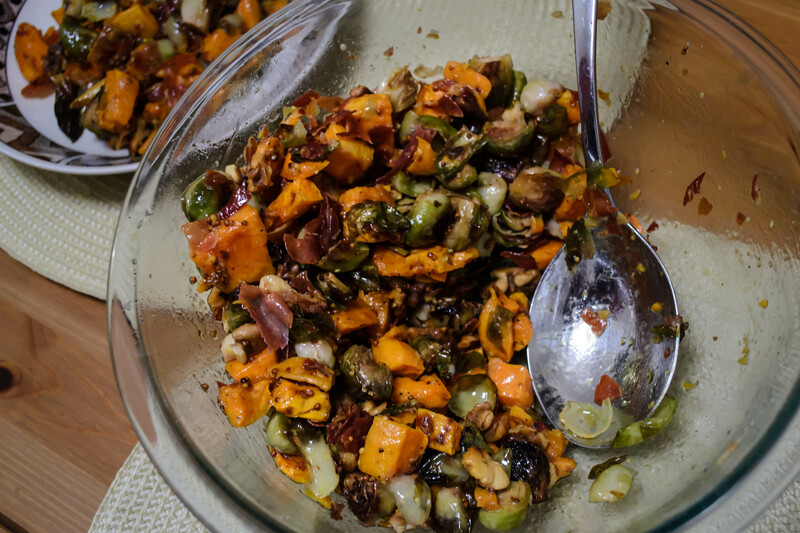 The first time I made it, this autumnal tumble of sweet potatoes, brussels sprouts, prosciutto, and walnuts, I had baked the prosciutto into saliva-inducing crisps, toasted the walnuts, and cooked off the sweet potatoes. All that remained, aside from a tart dressing I knew would involve whole grain mustard and cider vinegar, was to slice up a mess of brussels sprouts. To save on dishes, because N. hates washing the food processor, I was doing this delicate slicing by hand and, well, my hand slipped. In a matter of seconds, I was outside, sitting on the porch step with my hand in the air and my head between my knees thinking it was too early for the sky to be so dark, and N. was running for a bandage and asking questions about something called an emergency room. When my head cleared a little, I decided the cut wasn’t bad enough to merit a hospital run, but it was bad enough that I wouldn’t be able to finish dinner. You’re up, N! We tagged out and N., usually a bit shy in the kitchen, did an admirable job slicing the rest of the sprouts, whisking up a sharp, perfectly acidic dressing, and tossing everything together. We ate, I recovered, and I suddenly had a fantastic war story to exchange with my sister when she suffered her own bit of kitchen clumsiness a few weeks later. The dish stayed in the back of my mind. It was good when we ate it – nice for the day we’d had which, though warm, carried hints of cooler evenings to come – but I kept wanting more. The flavors should be deeper. The rawness of the brussels sprouts was okay, but with toasty edges they would be even better. My fix, as it usually is for things involving vegetables, was to roast everything. This created, I’ll admit, a bowl of cubes and shards that would never pass muster on a Pinterest board worth its salt. However, it makes up for its homeliness by combining all the fall flavors and textures I was yearning for. 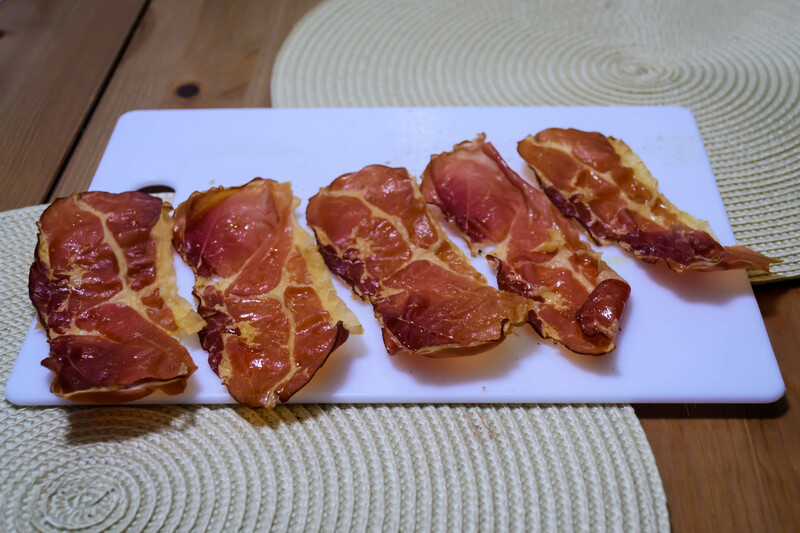 It is sweet and earthy and vegetal, with the right amount of saltiness from the prosciutto. The walnuts have a slight, slight bitterness, which contrasts nicely against the sweet potato. And the dressing, tangy and light and packed with tiny mustard seeds that pop between your teeth, soaks down into the vegetables and lifts the whole thing back up into perfect, warm, satisfying fall salad territory. 16 ounces brussels sprouts, stem ends and any wilted or yellowing leaves removed, halved or quartered. 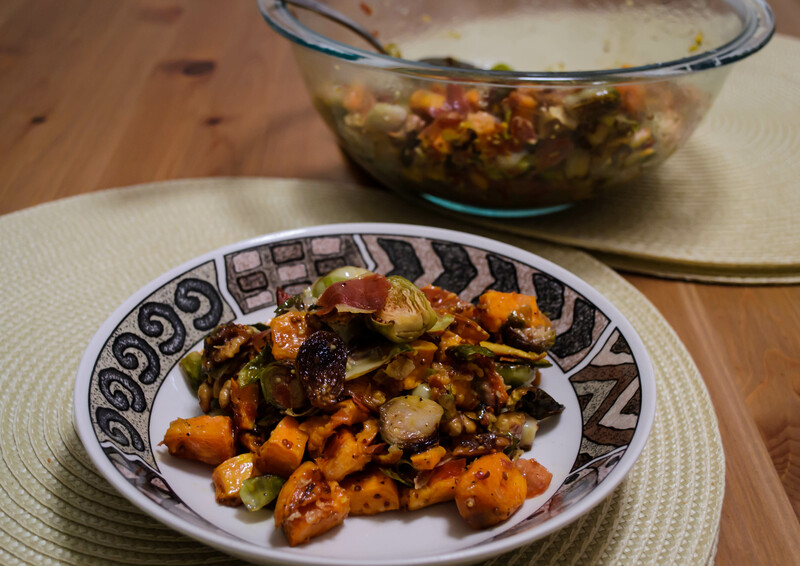 You want the sweet potatoes and the Brussels sprouts roughly equal in size. Preheat the oven to 450F and line a baking tray with aluminum foil. Pour 1 tablespoon of the olive oil directly onto the foil-lined tray and place the tray in the oven while it is preheating. While you wait for it to warm up, prep the vegetables. 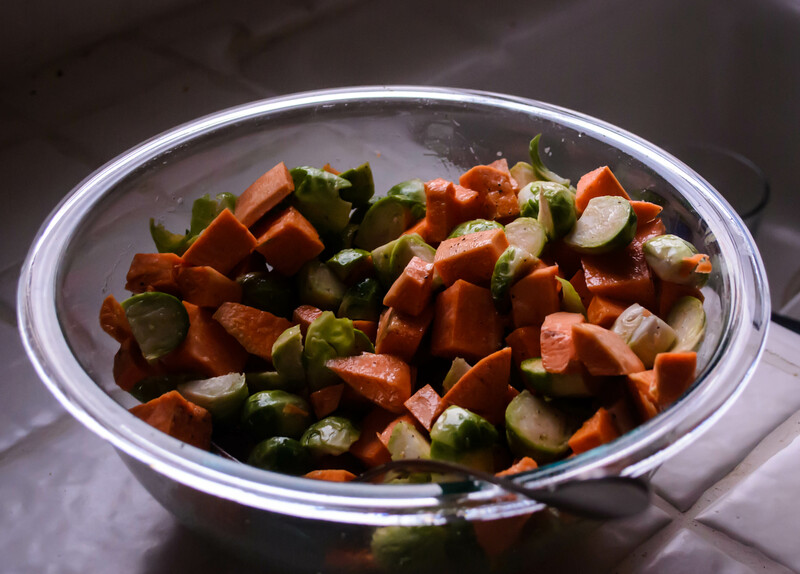 Toss the sweet potato chunks and Brussels sprout pieces in a large bowl with 1 tablespoon of the olive oil, the salt, and the pepper. Once the oven is preheated, transfer the vegetables to a single layer on the foil-lined tray that has been heating up inside. The additional of the oil already on the tray means the exteriors of the vegetables will start cooking immediately. As soon as you place the tray of vegetables into the oven, turn the heat down to 425F. 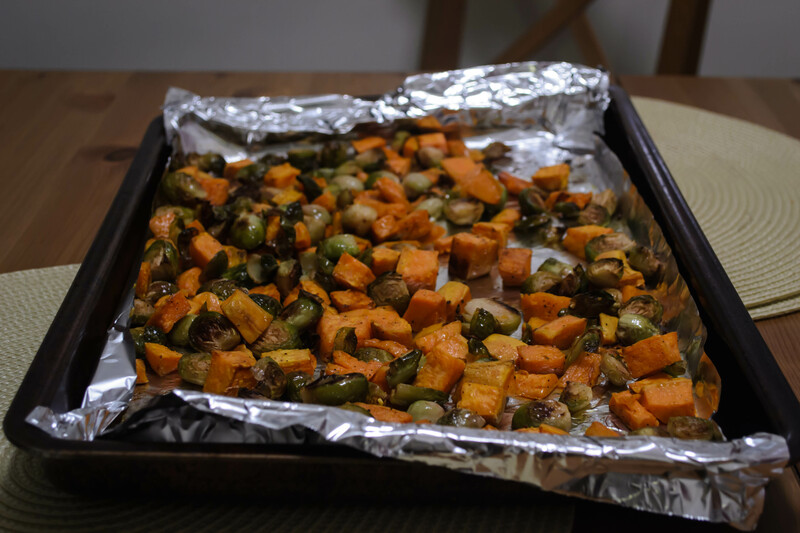 Roast the sweet potatoes and Brussels sprouts for 20 minutes, then toss them to promote even browning and roast for an additional 20 minutes. 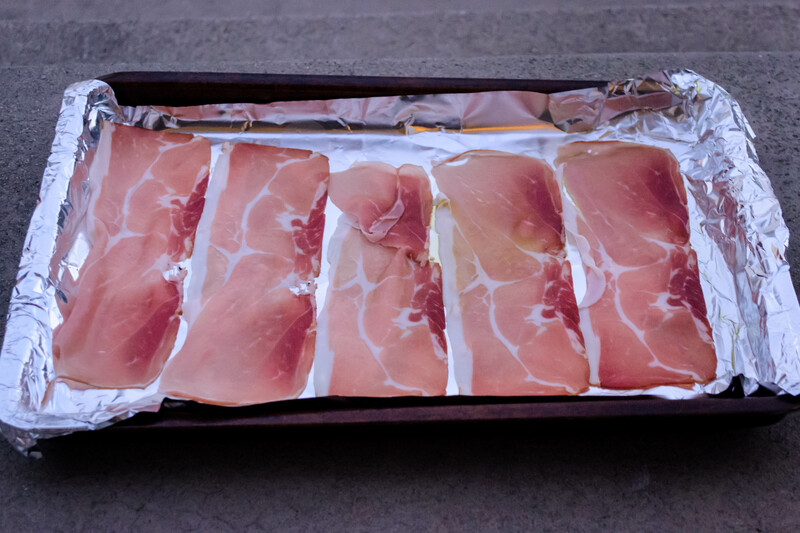 On another foil-lined baking sheet, spread out the prosciutto so the slices do not overlap. During the second 20 minute roasting of the vegetables, add the prosciutto tray to the oven and cook for about 10 minutes, until the slices are almost crisp and lightly bronzed. Remove prosciutto slices to a paper towel to drain and cool, and add the chopped walnuts directly to the tray that previously held the prosciutto. Roast the walnuts for 5-6 minutes, until fragrant and slightly darker in color (keep an eye on them, though; they burn fast). While the ingredients are roasting, make the dressing. In a large bowl (it can be the serving bowl, to save on dishes, if you like), whisk together the mustard, the honey, and the cider vinegar. While whisking, slowly pour in the remaining 4 tablespoons of olive oil. Taste and adjust seasonings if desired, but remember that the vegetables are already seasoned and the prosciutto is quite salty. When the vegetables are roasted to your liking (I like them golden with slightly crusty edges, and yielding on the inside), remove from the oven and place them directly in the bowl with the dressing. Toss to combine. Crumble or chop up the prosciutto into bite-sized pieces, and add it and the walnuts to the bowl as well. Toss again to integrate, and serve warm or at room temperature. This entry was posted in Gluten-free, Nuts, Pork, roasting, salad, sweet potato, Veggies and tagged brussels sprouts, prosciutto, walnuts by Chelsea. Bookmark the permalink.